One such problem is that of shoulder bumps that appear on sweaters that have been hanging in the closet for a prolonged period of time. Others include stuck zippers, stubborn stains, and foul odors. These are hard to deal with and may make you feel like your otherwise perfect outfit has been ruined. However, your sartorial woes have a solution. This post brings to you a few tips that will help you make your seemingly-ruined clothes wearable again. To use the tagline of one the most-watched shows of our times, Game of Thrones, winter is coming. This means our sweaters are going to be out of the closet soon and be in constant use. While folding them may be the best way to store them, not all of us are able to spare that much space in our closets. So, we hang them instead, which is okay until the sweaters start developing those hideous and stubborn shoulder bumps from hangers (in the area of the curve of the hanger). While the sweater may still be wearable technically, the bumps rob it of its neat look when worn. Fortunately, these can be defeated. Whatever you do to prevent shoulder bumps from hangers, refrain from putting the sweater on the hanger and shoving it in your closet. Instead, try the following few hacks to bring it back in shape. An easy way to deal with this problem is to fill a clean spray bottle with some clean water and spritz some of it over the exterior area of the sweater. Put on the sweater and leave it on you for around 30 minutes to an hour. Allow the heat from your body to react with the dampness of the sweater, which will ultimately flatten the bump. If the above technique doesn’t work, try spritzing the water again and get hold of a blow dryer. Put it on high heat setting and direct the air flow towards the damp area on the sweater. Use your fingers to flatten the bump as you blow dry. Both the above techniques are effective as when you wet the sweater, the fibers will shrink back to their normal size once they dry. Instead of spritzing water, you can also rub an ice cube over the bumps. If you want to smoothen out the bumps just before getting dressed, hang the sweater in your bathroom when you take your morning shower. This works well because the steam from the shower can help ease the swells. If you have more time on your hands, try washing the sweater in water at room temperature and lay it out flat to dry over a towel. Alternatively, feel free to spin it in your washing machine for a while before laying it out to save on drying time. Avoid hanging your sweater and fold them instead. However, if you do hang them, take a leaf out of the dry cleaner’s book and fold the sweater in half and put it on the bottom of the hanger. 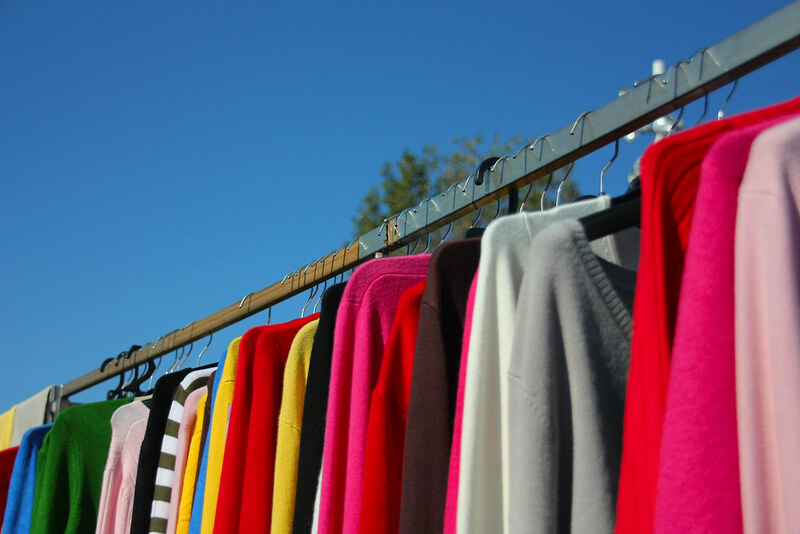 Again, if hanging your sweaters is unavoidable, use padded hangers or satin hangers instead of plastic or wire hangers to avoid shoulder bumps from forming. You can either make your own padded hanger or buy stunning satin hangers online, where they’re easily available at reasonable prices. These hangers will neither give rise to bumps on your clothes nor will they stretch the garments. No way out but to hang your sweaters? Still wondering how to prevent shoulder bumps from hangers? Try this handy tip: Fold you sweater in half with the sleeves stacked as well. Take the hanger and place the hook in the underarm. Next, fold the body of the sweater over the hanger arms followed by folding the sleeve over the hanger arms. By doing so, you will have distributed the weight of the sweater evenly on the hanger, resulting in zero hanger bumps. It is not just your sweaters that can develop shoulder bumps from hangers. Other garments made from delicate fabrics are also susceptible to them. Beat the bump woes like a boss by hanging the garment inside-out so that if the protrusions are created, they will appear on the inside of the garment and gradually smoothen out when the clothing item sits on your body (Don’t forget to turn your garment right-side-out before putting it on, else you may end up enduring a fashion faux pas that’s worse than wearing clothes with bumps). 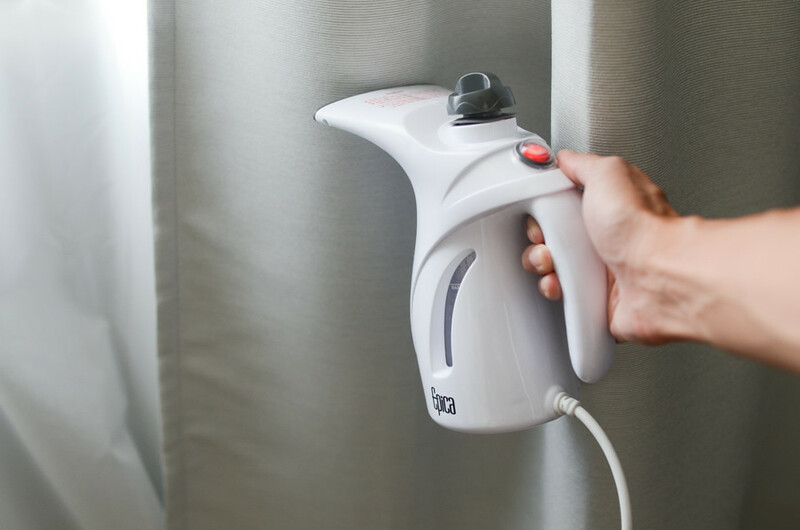 It also makes sense to invest in a handheld clothes steamer as it can help you get rid of wrinkles and bumps on your clothes in a jiffy. A stuck zipper is one of the most common and annoying problems that one can face. The worst thing about it is that this can happen anywhere and cause major embarrassment. There are two ways to sort it out. All you need to do is gently tug at the side of the zipper to remove any particle stuck in it. Next, rub the tip of a pencil over the zipper. The smooth graphite acts as a lubricant and should be instrumental in helping you smoothen the zipper. You can also apply some lip balm to both sides of the zipper and gently move it up and down. Reapply if needed. Don’t have lip balm? Use wax from a leftover candle and try the same procedure. It should work like a charm. As unbelievable as it sounds, you can prevent the run from getting worse by using daily supplies found at home. You’re going to need glue, or clear nail polish or hairspray. Apply any of these to the run in the stocking. The idea is to use something sticky that will dry quickly. If the hole is high enough, you can also use some correction fluid to make it work. Stains can catch you anywhere. Maybe one day you and your colleague ordered some spicy Indian food for lunch and got excited to eat it, only to end up spilling curry on your shirts. The stain is going to be stubborn to get off, unless you act quickly. How do you do that in the office? With the help of the dishwashing detergent, of course! If you do drop food on your clothes, head to the kitchen sink and apply the regular dishwasher detergent (every office is bound to have this) directly over the stain as soon as you can and wash it off with water. This makes perfect sense since the detergent gets rid of grease and food color on dishes, and will work on clothes too! Add white vinegar to the fabric softener/bleach dispenser section of your washing machine along with the usual amount of laundry detergent. Run the load as you do daily and watch (or rather smell) the magic! Don’t use a washing machine? Add ½ cup white vinegar to a bucket full of the water-detergent solution and use this to wash your clothes as you normally would. It will have the same effect. Wash your clothes and prepare the final rinse by adding 1 cup white vinegar to water. Doing so will eliminate any smell emanating from the clothes and also remove any detergent residue stuck in the fabric. This also works as an effective fabric softener. Make it a point to remove the laundry from the machine and dry it as soon as the washing is done with. Everyone wants their clothes, whether seasonal or regular, to always look tidy and smell great. This is easily achievable with some care and effort. The above easy tips and tricks should help you keep your woolen, delicate and regular clothes in good shape so that you always razzle and dazzle in whatever you choose to wear. If you’ve dealt with these kind of issues using other hacks, do share them with us in your comments.